You have just served a wonderful dinner to your quests and now it is time to retire to the living room and serve your favorite liqueurs in these elegant Christmas cordial and liqueur glasses with matching carafe hand painted with a Poinsettia Christmas design. 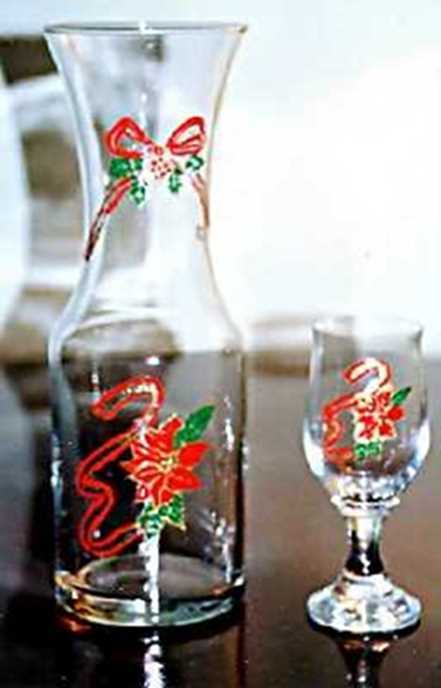 Pour your favorite libations such as brandy, port or whiskey from a hand painted Christmas Wine Carafe. Carafe and Liqueur Glasses Set of 4 ....$100.00.